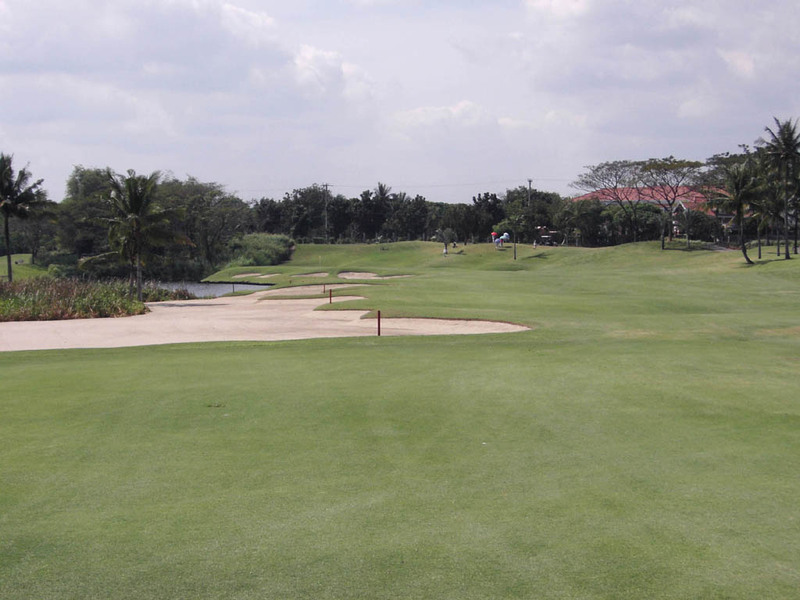 The Manila Southwoods Golf & Country Club is composed of two flat 18-hole courses, the Masters Course and the Legends Course. The Masters Course design strategy is punctuated by traps and water hazards while high mounds characterize the Legends course. The Masters Course's layout is demanding because the total length is over 7,200 yards, with well-positioned lakes, creeks and bunkers. 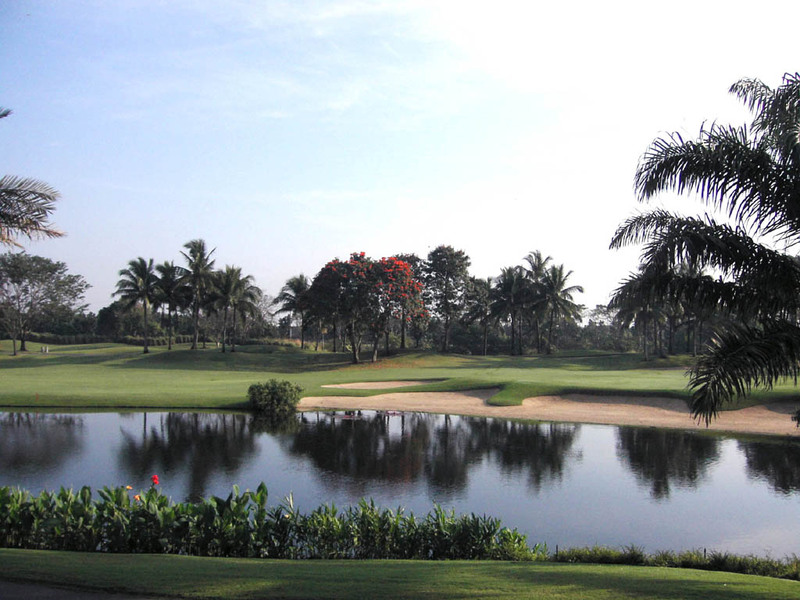 Water comes into play on 15 out of 18 holes. 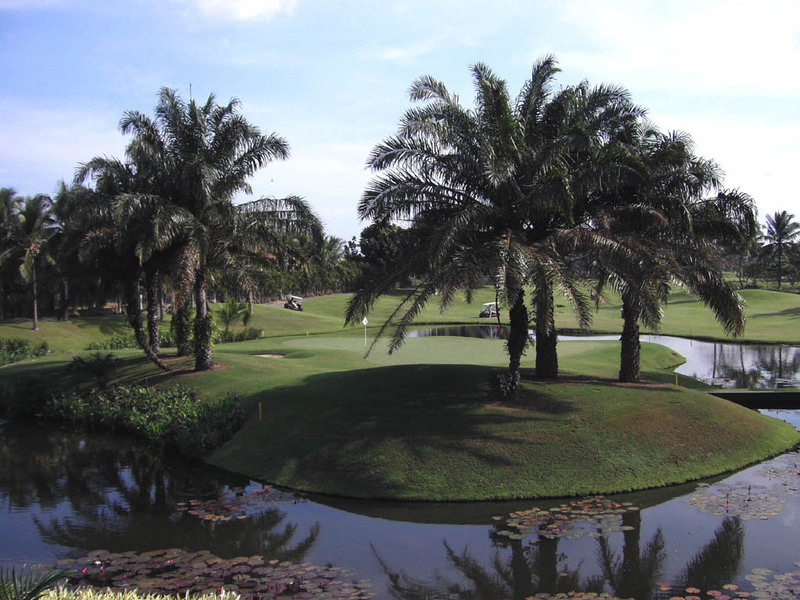 Another feature is that many hazards are placed on the left side of the fairways and the greens, as often seen in Nicklaus designed courses. 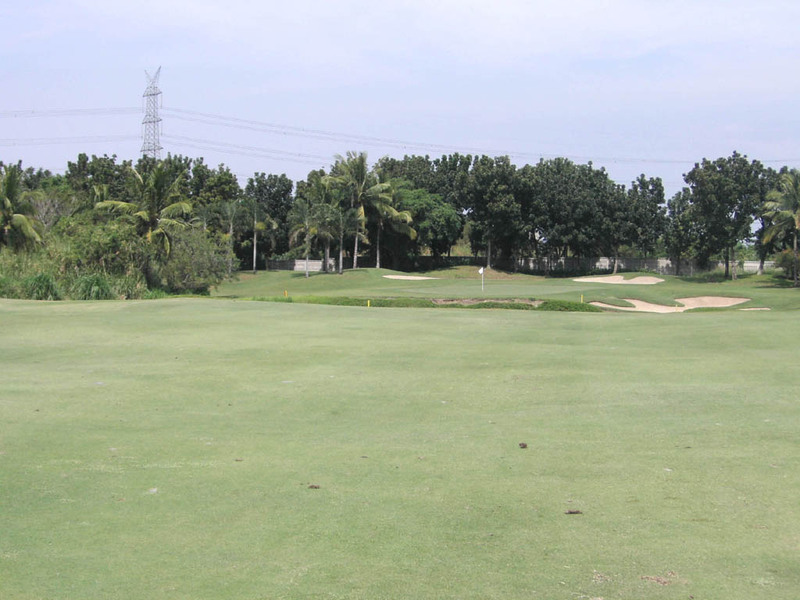 So, this course is suitable for fade ball hitters with high trajectories. 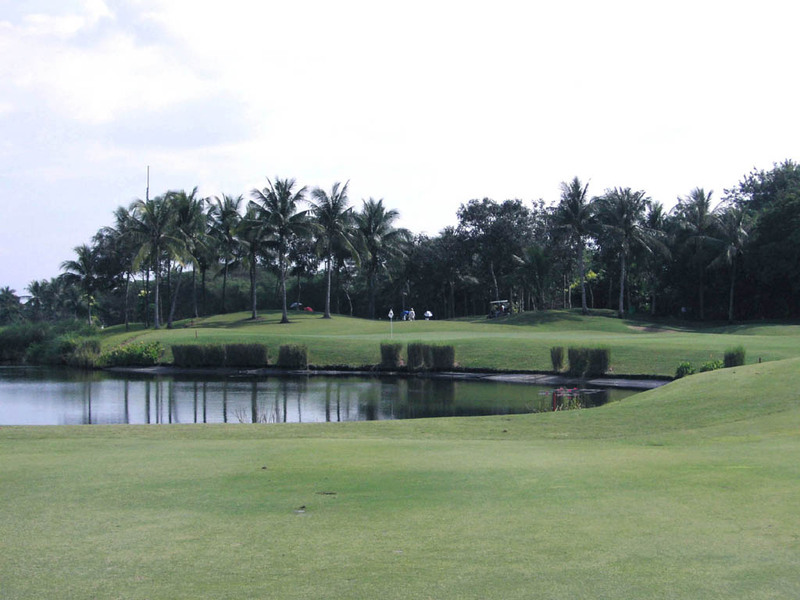 A pond runs down the left side of the fairway and curls in to protect the front side of the green. 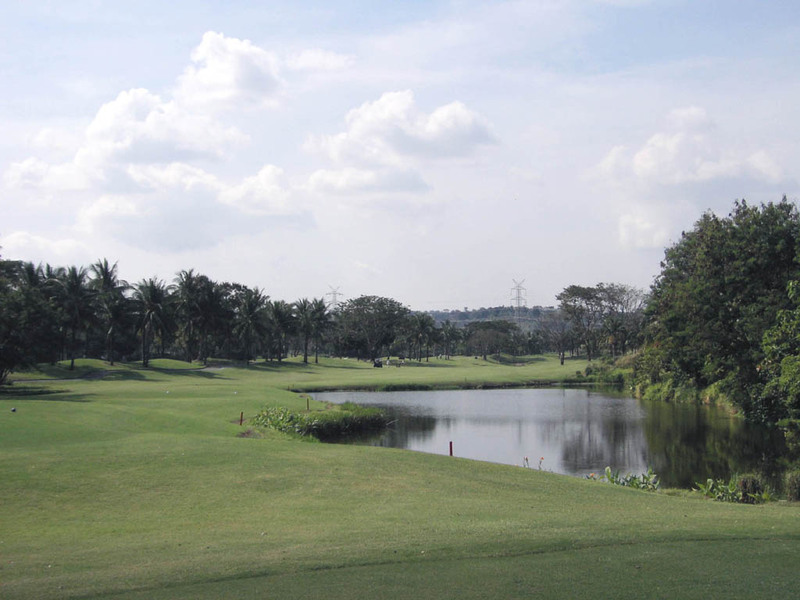 A poor tee shot leaves a longer shot over water to an angled green. 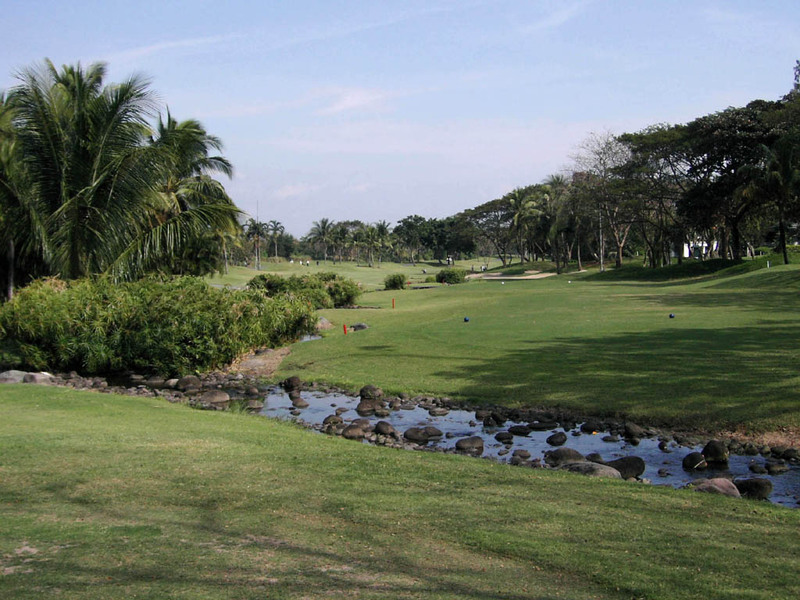 A creek crosses the fairway diagonally 150-200 yards from the green and the creek snakes around the green on 2 sides. So you must cross water twice. 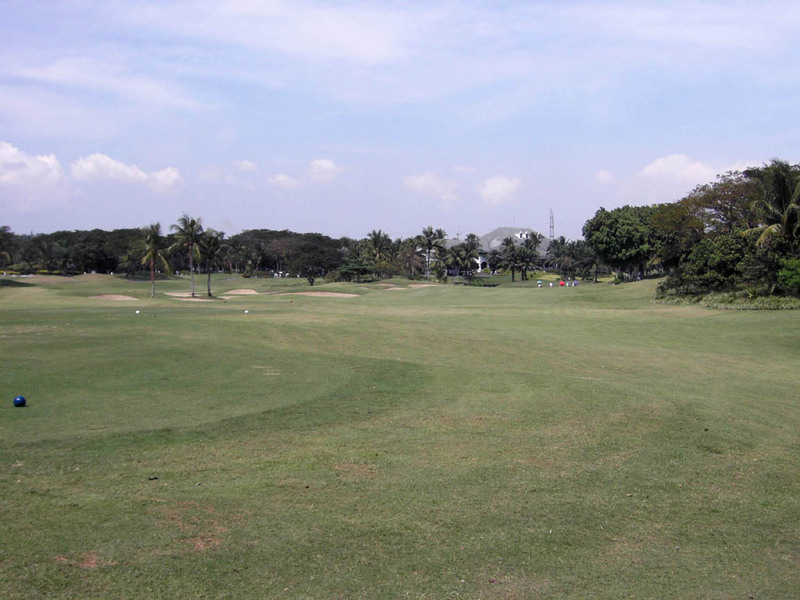 A dogleg to the right, handicap-1 hole. The bunkers on both sides of the narrow fairway come into play off the tee. 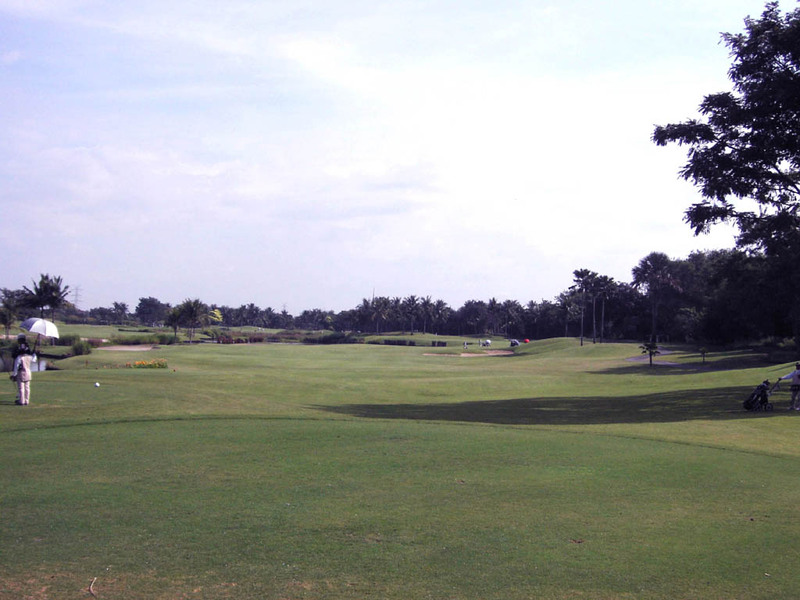 There is a pond on the right side of the fairway and a river beyond it. 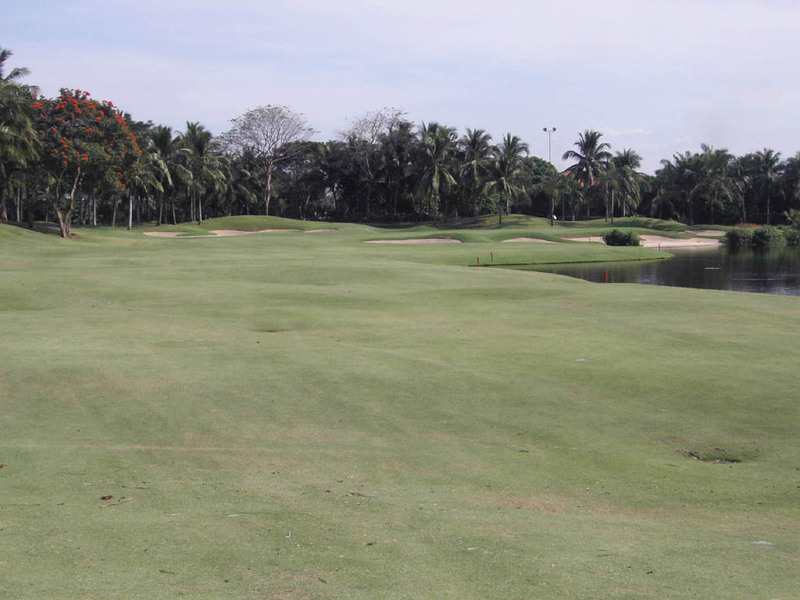 The approach shot is over the river to a deep green guarded on both sides by deep bunkers. The best angle to the green is hitting from the right half of the fairway to avoid carrying over the very deep bunker protecting the left side of the green. 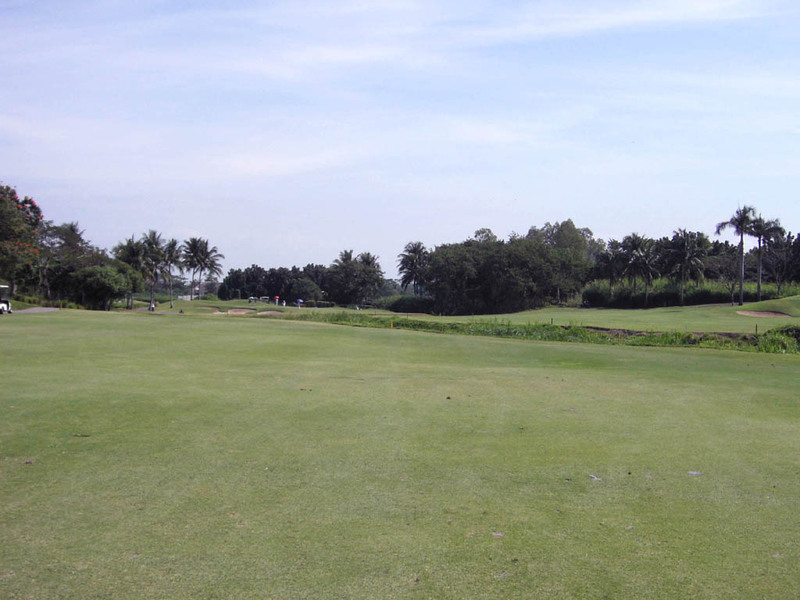 A straight hole with water on the left and the green is off a little to the left. 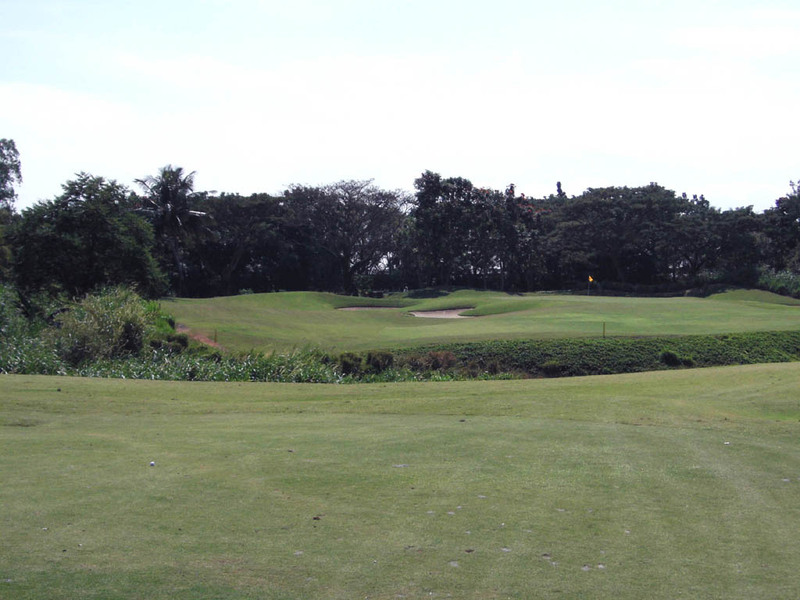 The deep but narrow green is guarded on three sides by water and bunkers. 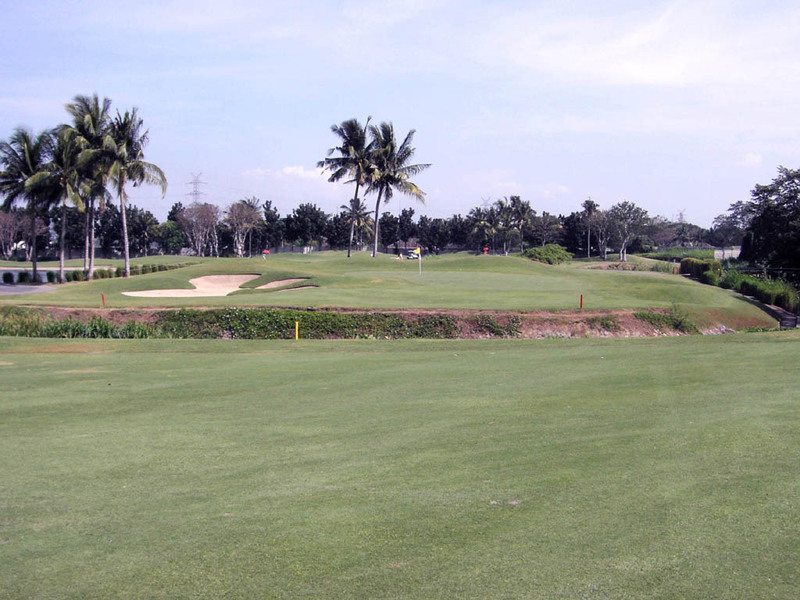 The landing area off the tee is squeezed by bunker to the left and trees and O.B. to the right. It is the second shot that is really daunting. 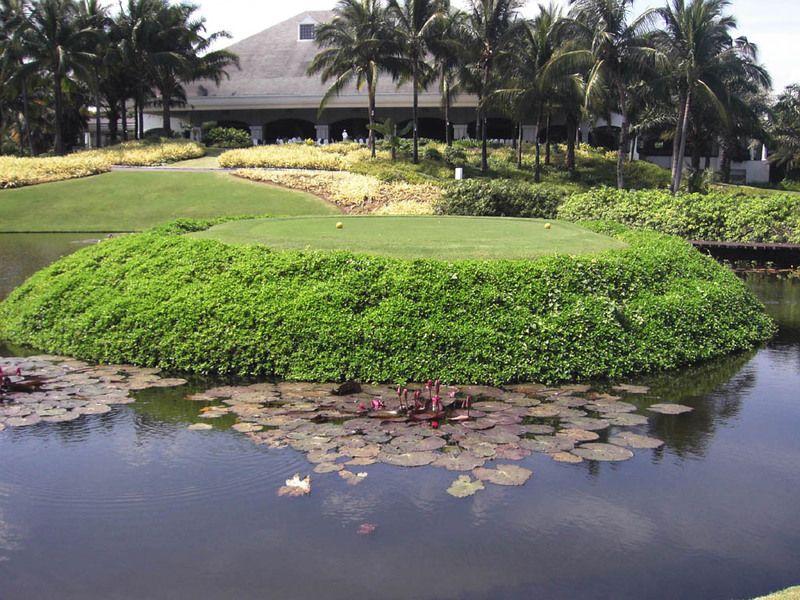 You need to hit onto an island green surround by water. The green seen from behind is beautiful. A slight dogleg to the left. 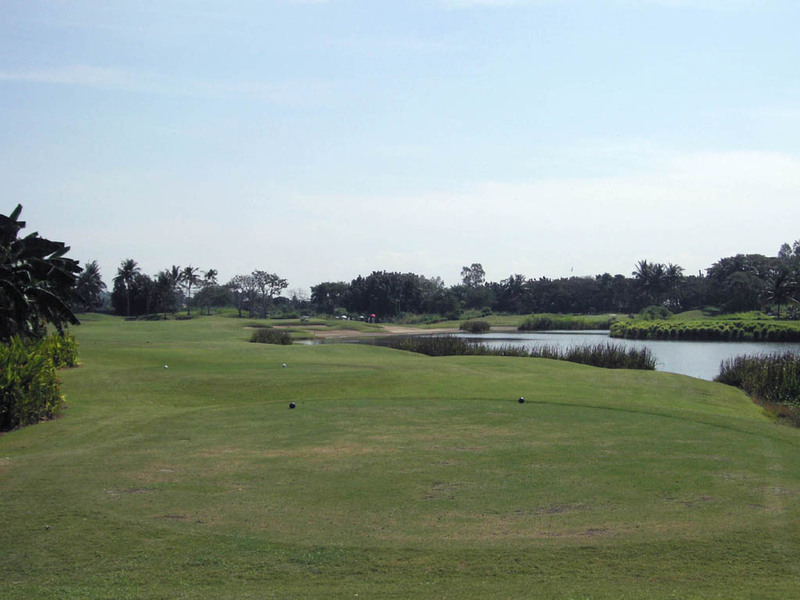 A shallow creek runs along the fairway on the right and forms a pond in front of the green. Compounding the difficulty is that the pond guards the entire right side of the green. 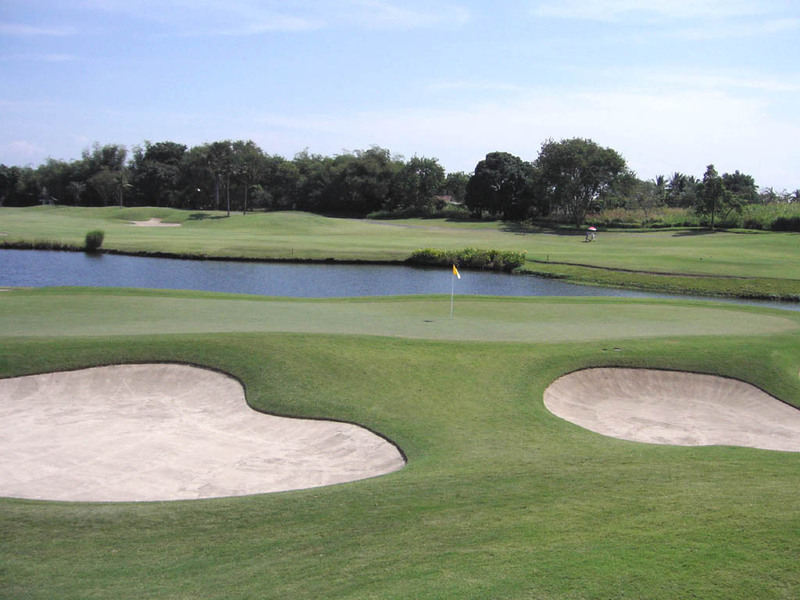 There isn't a single bunker on this hole but it is still a good hole and difficult too. 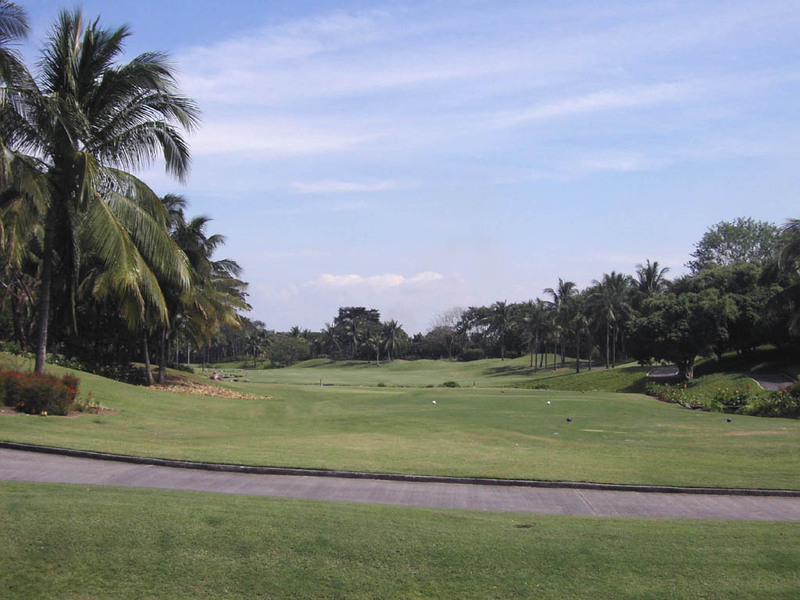 This hole was selected as one of the best 500 holes in the world by US Golf Magazine in 2000. The championship tee is unique as it floats on a pond. 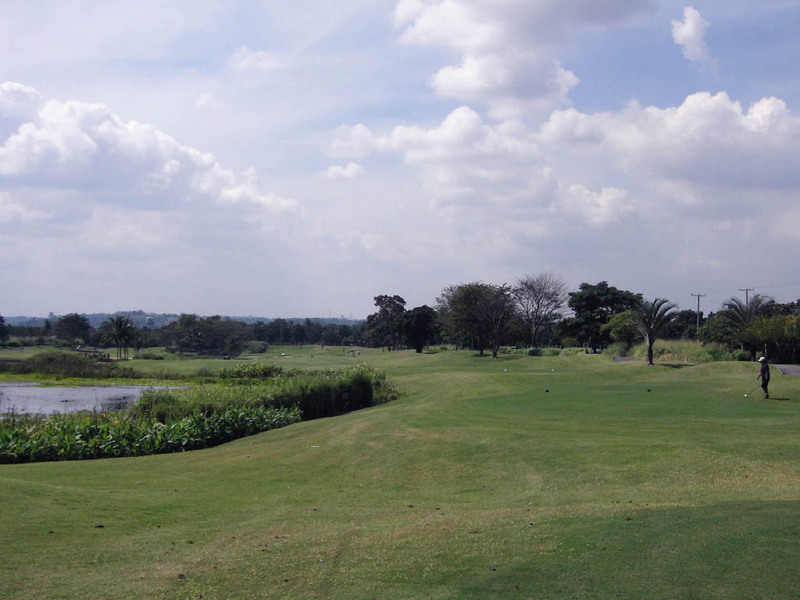 The tight fairway is guarded by a lake and bunkers on the left. The second shot needs to carry over a creek. 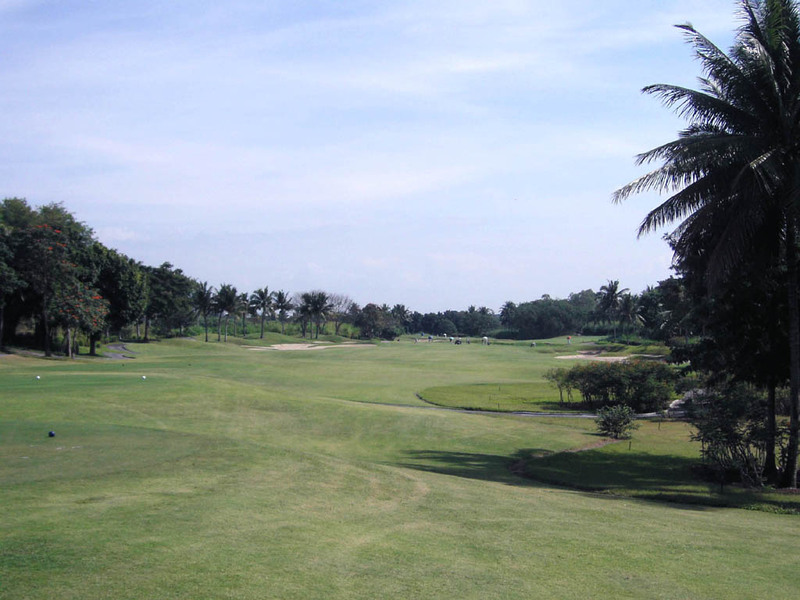 A long par 4. 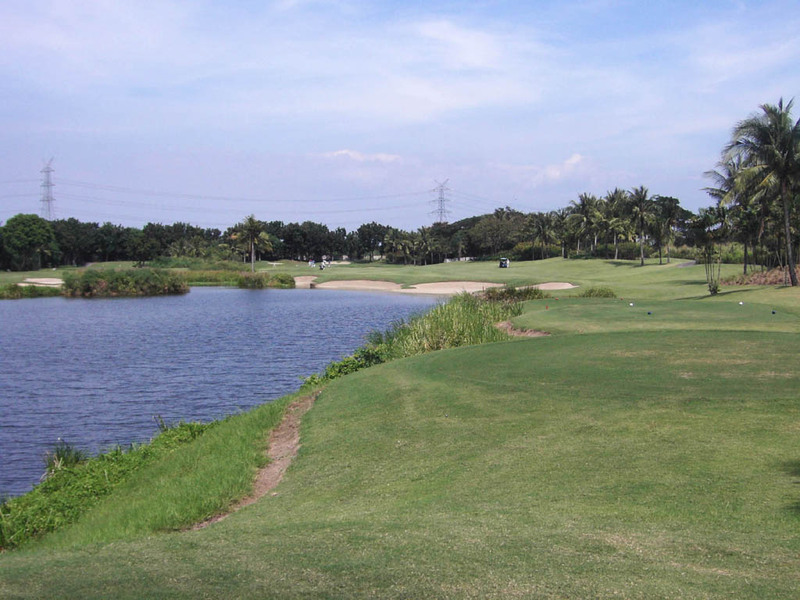 A carry of 200-250 yards is needed to clear the water off the tee. The green is guarded by bunkers. A neat, slight dogleg to the right. There is a creek and a pond on the right. 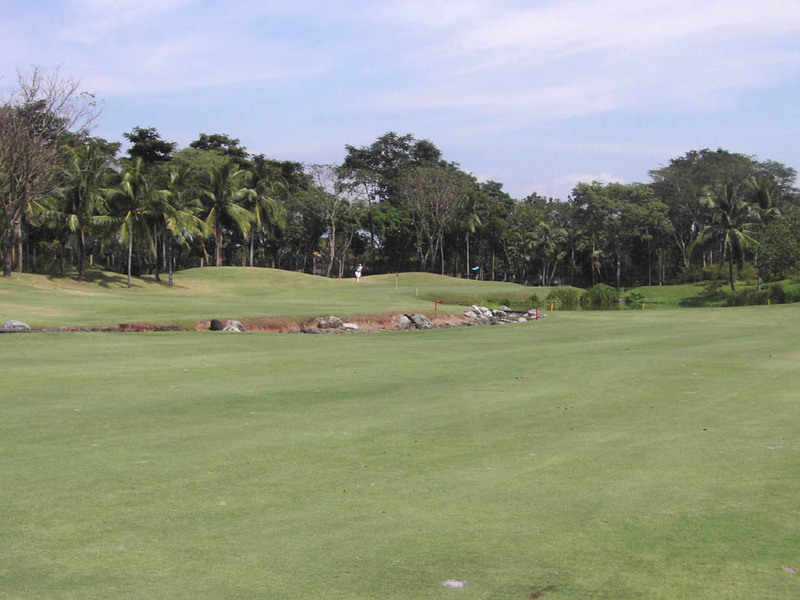 A bunker 30 yards in front of the green comes into play for long hitters. The bunkers around the green are strategically placed. 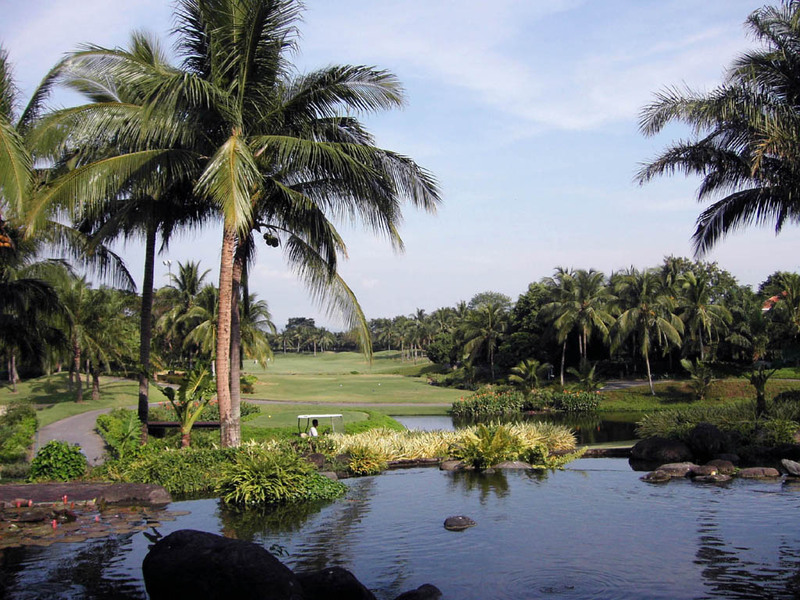 It takes 40 minutes by car from Central Manila. 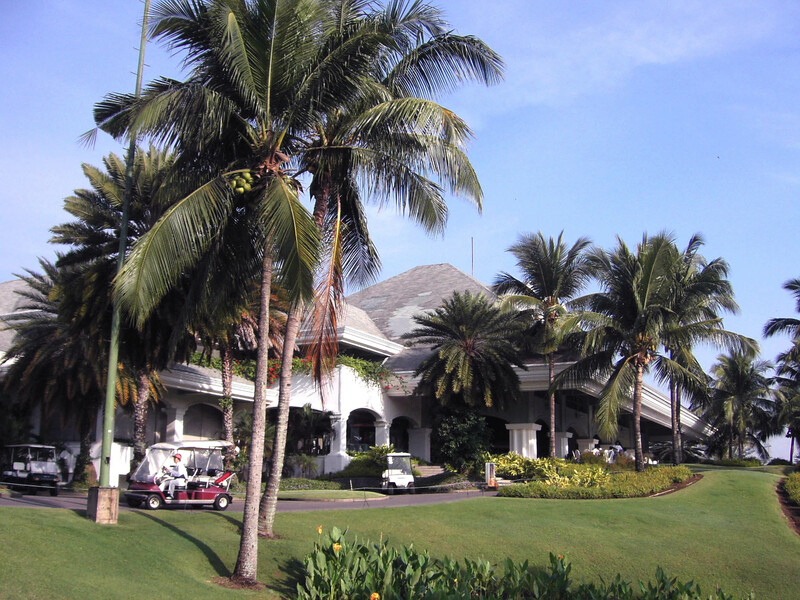 You need to be accompanied by a member to play at the Masters Course. You can book through a travel agency to play at the Legends Course. 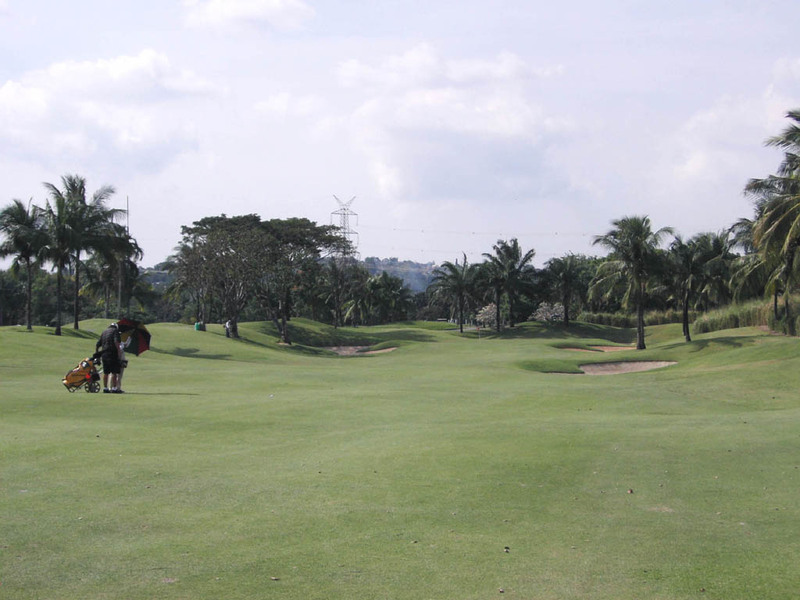 The Master Course was voted as the 4th best course in the Philippines by Golf Magazine Asia in 2004. 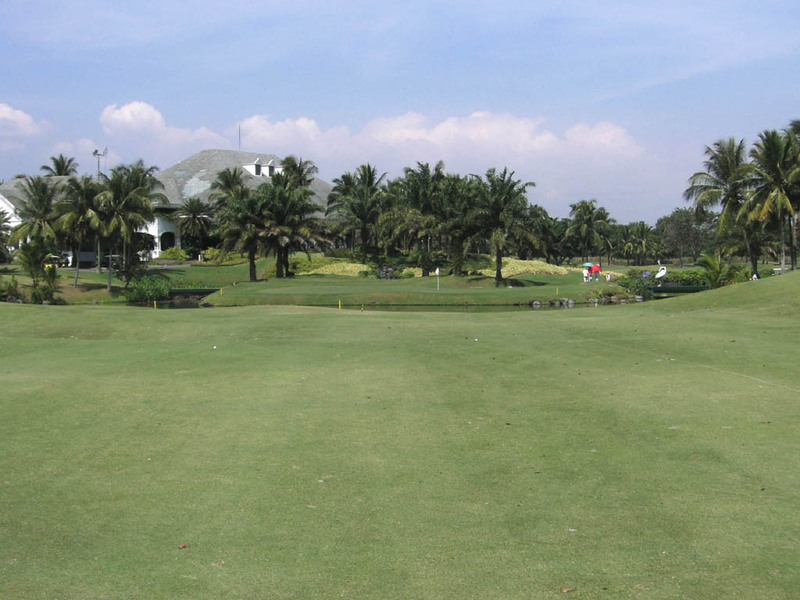 The other Jack Nicklaus designed courses in the Philippines are Sherwood Hills GC, Camp John Hey GC and Forest Hills GC.